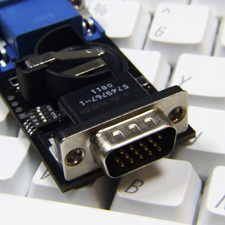 The BSODomizer is a man-in-the-middle device that connects between a target computer and monitor. It intercepts the legitimate video signal and replaces it with a fake BSOD (Blue Screen of Death) or other user-defined image at a pre-configured time interval or when triggered by an infrared remote control. The BSODomizer can automatically detect when the target computer is turned off or restarted, in which case it will revert to the harmless video pass-through mode leaving the user unaware of any wrongdoing. 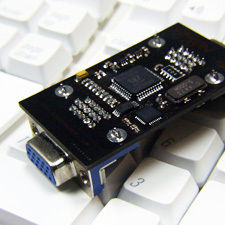 Released in 2008, the original BSODomizer produces a text-only display at 1024×768 resolution and connects to the target through an HD-15/VGA interface. Two CR2032 3V Lithium coin cell batteries provide the required power. It is no longer being produced. 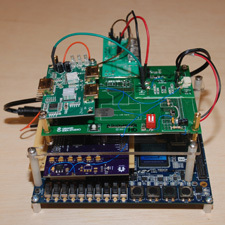 BSODomizer HD, created in 2016, is an enhanced, FPGA-based version of the BSODomizer. It features improved graphics interception and triggering capability, and produces a 1920×1080 (1080p) resolution image on any HDMI-compliant display. The BSODomizer HD is a proof-of-concept design using an Altera Cyclone V GX Starter Kit combined with custom circuitry. A 3.7V Lithium Polymer rechargeable battery provides power to the system and is charged by the target computer via its HDMI connection while in pass-through mode. The BSODomizer HD hardware supports the screen capture of non-HDCP targets and image storage/retrieval via microSD card, but those features are not yet implemented within the FPGA. Uses of the BSODomizer include penetration testing, video display calibration, mischievous acts, or as an embedded system/FPGA reference design. Co-developed by Joe Grand (aka Kingpin) of Grand Idea Studio and Zoz of Cannytrophic Design.